The Metro Gold Line Tokyo/Arts District Station will be closed on Saturday, April 21 as work progresses on the Regional Connector Transit Project. While the station is closed, construction crews will begin building the 1st Street portal, where trains to/from East Los Angeles will enter and exit the new tunnel. Free bus shuttles will be available to pick-up and drop-off riders between Union Station, Little Tokyo and Pico/Aliso Stations during the closure. Buses will operate every 12 minutes. The trip between Union Station and Pico/Aliso is expected to take about 15 minutes. 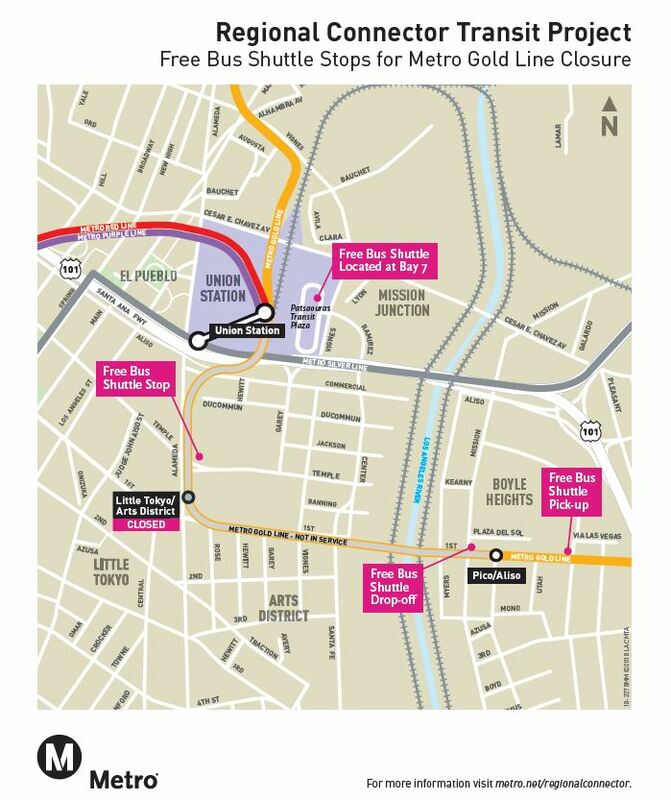 The Little Tokyo/Arts District shuttles will pick-up and drop-off at Temple/Alameda. The Union Station shuttle stop will be located at Patsaouras Plaza Bay 7. Shuttles for Pico/Aliso Station will pick up at Marquez/1st and drop off at 1st/Mission. For alternate service, consider the Metro Local 30, which travels along the Gold Line between Boyle Heights and Downtown Los Angeles. Gold Line trains between APU/Citrus College – Union Station and Pico/Aliso – Atlantic are slated to run every 12 minutes during the day, and every 20 minutes late-night. Train service to Little Tokyo/Arts District Station will resume Sunday, April 22 at start of service, just in time for the free rides on Earth Day. Eastbound 1st St. will remain open and pedestrian walkways will be accessible at all times. For more information, see the construction notice. 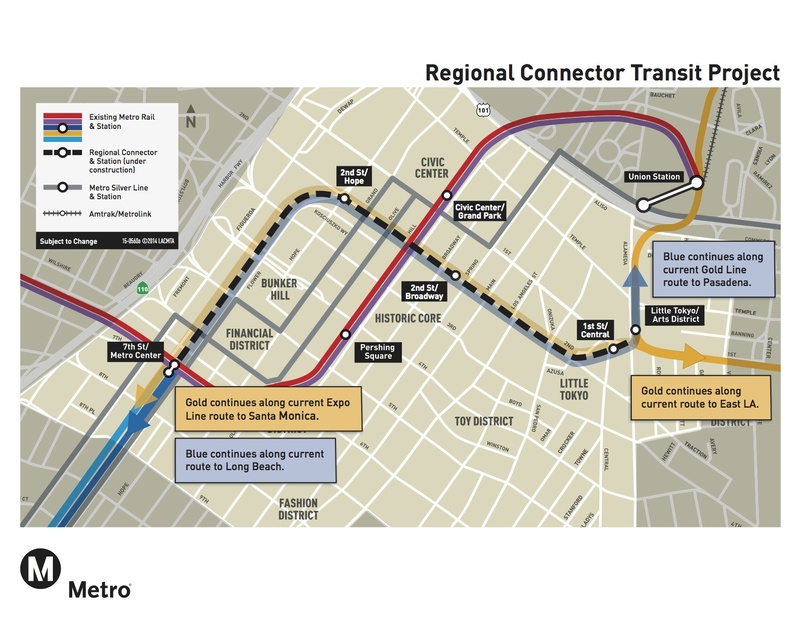 The Regional connect is a 1.9 mile underground light rail line that will connect the Blue, Expo and Gold Line to Downtown Los Angeles. The project includes three new stations at 1st/Central, 2nd/Broadway and 2nd/Hope. The project will allow more frequent light rail service and reduce the amount of transfers needed to reach your destination. For more construction updates on the Regional Connector, visit metro.net/regionalconnector.